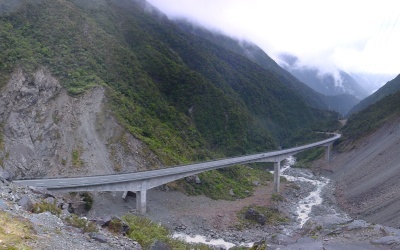 This photo is of the Otira Viaduct joining the East and West coasts of New Zealand just after Arthur's Pass. Looking at the Google Maps satellite view of Otura Viaduct you can see the road that this bridge replaced. While the incline, curvature and height of the bridge still make for an exciting journey it feels a lot less dangerous than the old road.